Let's say you want to copy the entire storage drive on computer A to computer B. This can be done with Clonezilla. There are various ways to accomplish this. 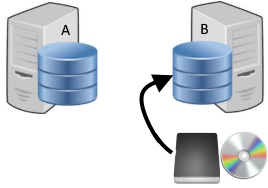 One method is to use a Clonezilla CD and an external storage drive to clone computer A to the external storage drive. Download the Clonezilla ISO from http://clonezilla.org/downloads/download.php. Boot computer A from the Clonezilla CD. Connect the external storage drive to the PC and press enter. Both the internal storage and external storage drives should be listed. Press Ctrl + C.
Select the external storage drive. Press tab twice and press enter. Type a name for the image, and press enter. Select the disk to clone, and press enter. Select Yes, check the saved image. There will be a series of prompts. Type y and press enter at each prompt. When the cloning has completed, you can reboot into your normal operating system. Connect the external storage drive to teh computer. The external storage drive should have one folder that contains numerous files. The name of the folder is the name of the image you selected. Connect the Clonezilla CD and external computer drive to computer B. Boot computer B from the Clonezilla CD. Select Disk to local disk. 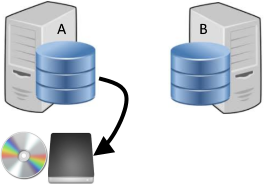 Select the disk in computer A. Select the external storage drive, press tab, and select Done. Select the internal storage drive. Select Yes, check the image before restoring. Repeatedly press Y until the cloning begins.